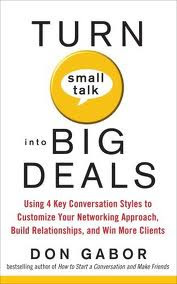 Turn Small Talk Into Big Deals – Don Gabor – Adventures in Networking! If ANY facet of networking annoys or mystifies you – this is the book to start 2011 with! WOW!! This book has come the closest to rivaling my all time favourite networking book after now over 50 networking books read. It goes on to share HOW to communicate and do business with each group ( this alone made it worth the read ). Each chapter has pointers for each group on what to watch out for, even if you’re a little of one or the other you’ll find great value in these tips! The depth and detail was simply astounding. If networking is part of your job, you’ll find huge value in this book!